Kamloops Art Gallery, Germaine Koh: Weather Systems, Kamloops, 2013. Author: Markus Miessen & Yulia Startsev, Sarah Cook. ECU Press and Charles H. Scott Gallery, Fallow, Vancouver, 2012. Author: Germaine Koh, Cate Rimmer & Lisa Robertson. Musée d'art contemporain de Montréal, L'envers des apparences, Montreal, QC, 2005. Author: Gilles Godmer with Nathalie de Blois. McMaster Museum of Art, Germaine Koh: Open Hours, Hamilton. ON, 2002. Author: Steve Reinke, Rosemary Heather. Gendai Gallery, Recollection Project, Toronto, ON, 2000. Author: Bryce Kanbara, Richard Fung. Art Gallery of Ontario, Waste Management, Toronto, ON, 1999. Author: Christina Ritchie. Richmond Art Gallery, Home Made Home: a Game Changer, Richmond BC, 2018. Author: Annabel Vaughan. "Germaine Koh: Around About", Border Crossings, Border Crossings, Winnipeg, MB, Spring 2002. P. 81-83, reprint of catalogue essay. Author: Cliff Eyland. "Josée Dubeau: in Outline", Axe Néo-7, Josée Dubeau, Gatineau, QC, upcoming 2010. Catalogue essay. Author: Germaine Koh. "Artists", National Gallery of Canada, Crossings, Ottawa, ON, 1998. P. 85-185, artist entries in exhibition catalogue. Subject: Cai Guo-Qiang, Maria Magdalena Campos-Pons, Carlos Capelan, Jimmie Durham, Mona Hatoum, Alfredo Jaar, Ilya Kabakov, Kcho, Lani Maestro, Vong Phaophanit, Yinka Shonibare, Jana Sterbak, Rirkrit Tiravanija, Xu Bing, Jin-me Yoon. Author: Germaine Koh. "Chaos Theories", SAW Gallery, exhibition esssay, Ottawa, ON, 1998. Subject: Anitra Hamilton, Adrienne Trent. Author: Germaine Koh. "Geographies of Desire", C Magazine, C Magazine, Toronto, ON, 1995. No. 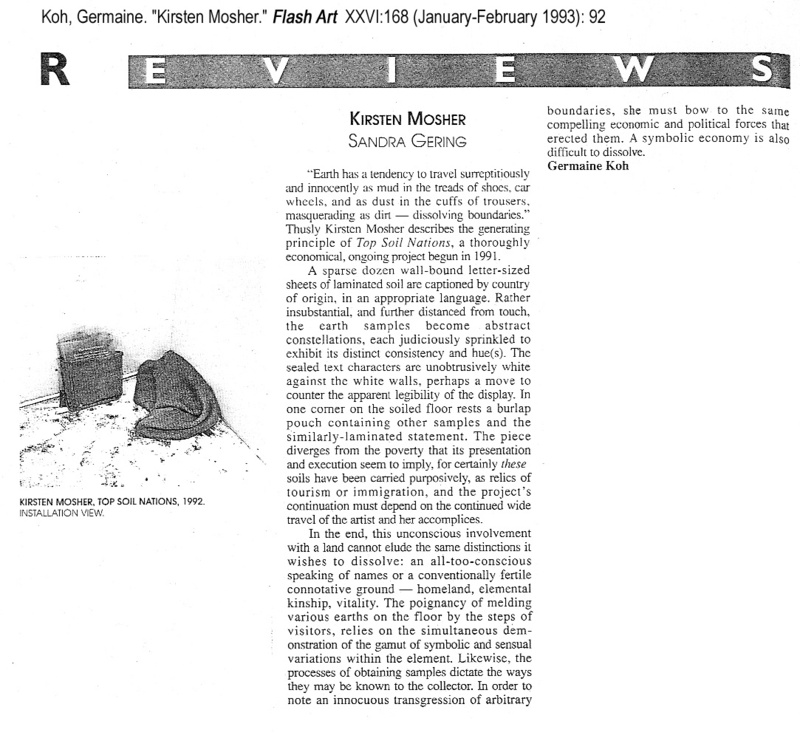 46, review of Ottawa Art Gallery exhibition. Author: Germaine Koh.